Lovebirds, like all birds, are very adapt at concealing their illness. This is a self-preservation mechanism, as the sick and the weak are the ones predators will focus on. By the time your lovebird looks ill, you can assume that your pet is seriously sick and is likely to deterioriate quickly unless appropriate treatment is provided. By observing your lovebird daily you will learn its normal behavior and you will be able to notice anything out of the ordinary. Below is a list of things to look out for as possible indicators of disease / illness; and a vet may need to be consulted. Vitamin A and calcium deficiency are the most common deficiencies seen in seed junkies. Since seeds are higher in fat than many other foods, many seed eaters are often obese as well. More information about calcium / Vitamin D Deficiency. Behavioral Plucking (sexual mature birds mainly). NOTE: Plucking can also be a sign of a Giardia infection. 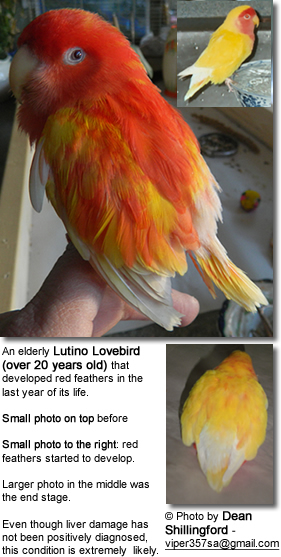 NOTE: beak deformities / problems and poor feather condition may also be an indicator of Fatty Liver Disease.